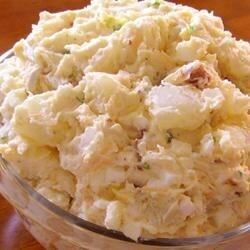 "An amazing potato salad, very simple to make. Always a hit at BBQs and family gatherings." Place potatoes into a large pot and cover with salted water; bring to a boil. Reduce heat to medium-low and simmer until tender, about 10 minutes. Drain. Place cubed potatoes into a large bowl. Place eggs in a saucepan and cover with water. Bring to a boil; simmer for 10 minutes. Cool eggs under cold running water and and peel. Chop eggs into small pieces and add to potato cubes. Add bacon, pickles, green onion, Cheddar cheese, parsley, salt, and ground black pepper to bowl. Stir to combine. Whisk together ranch dressing, mayonnaise, and mustard in a bowl. Add to potato mixture and mix well to coat. Refrigerate at least 2 hours before serving. This was decent but lacking flavor - I was very disappointed. These potatoes are pretty darn good! Who doesn't like bacon, potatoes & ranch? It was extremely dry. Added more ranch, mayo, (used sweet relish instead) and seasoned to taste then it was amazing. Great base recipe to add your own twist for sure!